50-1/2 to 51 in. W x 72 in. H; Door walk-in: 27 in. ; Stationary panel(s: 22-1/2 to 23 in. ; Flooring threshold depth should be a minimum of 5/8 in. 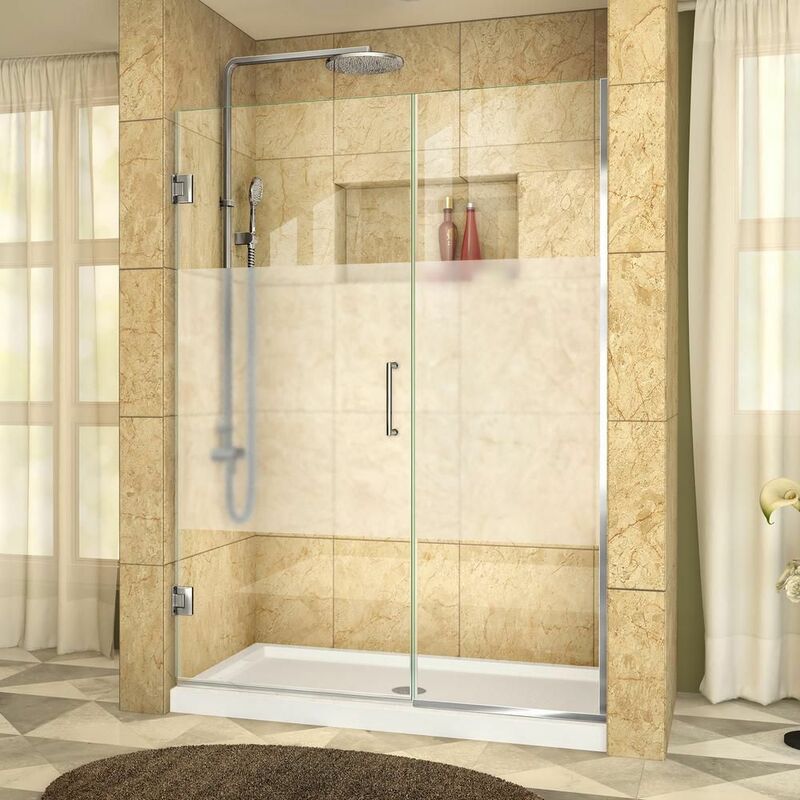 Unidoor Plus 50-1/2 to 51-inch x 72-inch Semi-Frameless Hinged Shower Door with Half Frosted Glass in Chrome The UNIDOOR PLUS shower door from DreamLine is perfectly designed to accommodate today's trends. It has a classic frameless design with three hardware finish options helping it enhance any bathroom style on any budget. With equal appeal and versatility as the original UNIDOOR, the UNIDOOR PLUS shower door adds an extra splash of class with an anodized aluminum U-channel. The UNIDOOR PLUS shower door combines premium 3/8-in thick ANSI certified tempered glass with a sleek frameless design for the look of custom glass at an unparalleled value. With clean lines, modern accents, an upscale look and a choice of clear or frosted band privacy glass, the UNIDOOR PLUS shower door adds a touch of timeless style to any bathroom space. DreamLine has the ultimate solution for your shower project. Note: To minimize leakage, install shower head opposite of door opening aimed at tiled walls, fixed shower panel or floor. Shower base is not included. Unidoor Plus 50-1/2 to 51-inch x 72-inch Semi-Frameless Hinged Shower Door with Half Frosted Glass in Chrome is rated 4.7 out of 5 by 3.